Does the United States need supertrains? The Obama administration has designated $8 billion in stimulus funds for high-speed passenger rail, buoying hopes that supertrains will operate throughout the American landscape as they do in Europe and Asia. The money, most likely to be divided among multiple corridors, won't buy a single fast-rail system. But supporters say it will help traditional trains run faster and pay for planning to make true high-speed rail networks a reality. Washington's support signals a transformation in federal policy that has long favored highway and air travel, experts say. Some argue that money should be focused first on building true high-speed service in the busy Northeast Corridor. But supporters in the Midwest, Florida, California and elsewhere are expected to vie for a portion of the rail funds. 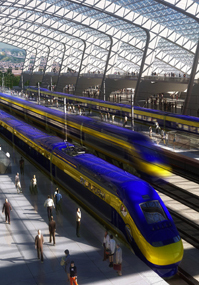 So far, California appears furthest ahead in planning for fast rail, aided by a $9.95 billion bond issue. But critics say the plan's benefits are exaggerated.